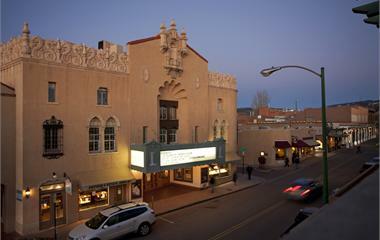 “The Lensic Performing Arts Center opened as a nonprofit in 2001 following the restoration of the Lensic Theater, a cornerstone of downtown Santa Fe since 1931. 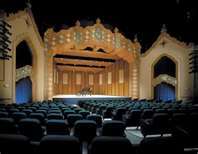 The Lensic is more than a theater to the people of Santa Fe. For most of the 20th century, the venue was a place for a first kiss in the balcony, a grand silver screen in the midst of the Depression, a vaudeville venue where the community could see the singers, actors, dancers and comedians of the day. It was a place where magic happened. The theater was in danger of becoming an empty house of more than 800 seats when in 1999 a vision for a world-class performing arts center was birthed. It was time for a new chapter in the venerated theater’s life. Thanks to a group of dedicated individuals who saw the potential for the venue and the future benefit for Santa Fe, the renovation and refurbishing of the old theater began in 2000 with gifts from individuals, local businesses, the city and foundations. The Lensic and The Santa Fe Opera proudly present the sixth season of The Met. This season’s exciting lineup includes seven new productions and two Met premieres, including Thomas Adès’ The Tempest and Gaetano Donizetti’s Maria Stuarda. Tickets are on sale now for all shows. You can check out their website at http://www.lensic.org/ for more details on tickets and times for the shows. The Lensic is a wonderful way to experience Santa Fe! It is in the heart of downtown with loads of restaurants nearby to grab a bite to eat before or after the show! This entry was posted in Uncategorized and tagged Adobe Destinations, entertainment, Gaetano Donizetti's Maria Stuarda, lensic, lensic theater, opera, performing arts, productions, santa fe opera, the met, theatre, Thomas Adès' The Tempest, travel, vacation rentals. Bookmark the permalink.